Scales the colors of the source clip by different amounts over time for a flickering effect. 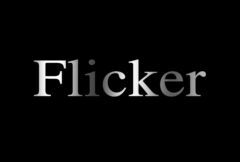 The pattern of flickering can be random, a periodic wave, or a combination of the two. Amplitude: Default: 0.2, Range: 0 or greater. Scales the amplitude of all flickering. Rand Luma Amp: Default: 1, Range: 0 or greater. The amplitude of smooth but random flickering affecting the brightness. Rand Color Amp: Default: 0, Range: 0 or greater. The amplitude of random flickering affecting the color channels independently. Rand Freq: Default: 30, Range: 0 or greater. The frequency of the random flickering. Increase for more variation between frames. Decrease for slower flickering. Wave Amp: Default: 0, Range: 0 or greater. The amplitude of periodic wave flickering. Wave Freq: Default: 5, Range: 0 or greater. The frequency of the wave flickering. Increase for faster flickering, decrease for slower. This has no effect if Wave Amp is 0. Wave R Phase: Default: 0, Range: any. Shifts the wave pattern in time, for the red channel. Wave G Phase: Default: 0, Range: any. Shifts the wave pattern in time, for the green channel. Wave B Phase: Default: 0, Range: any. Shifts the wave pattern in time, for the blue channel. Red Amp: Default: 1, Range: 0 or greater. Scales the amount of flicker applied to the red channel. Green Amp: Default: 1, Range: 0 or greater. Scales the amount of flicker applied to the green channel. Blue Amp: Default: 1, Range: 0 or greater. Scales the amount of flicker applied to the blue channel.